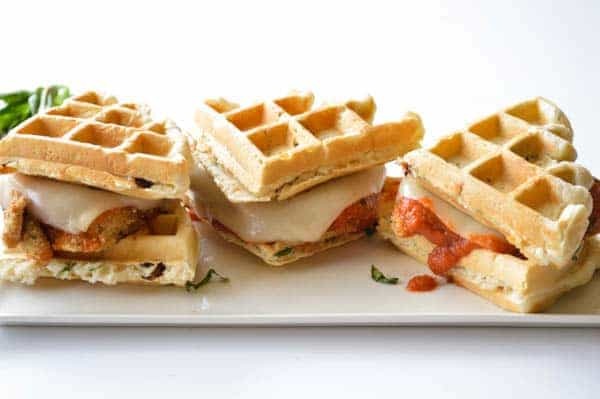 Tender breaded chicken smothered in marinara sauce and melted mozzarella sandwiched between two sundried tomato & basil waffles. 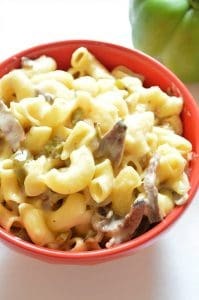 This is a quick and easy meal to throw together that will leave the family wanting it over and over again! 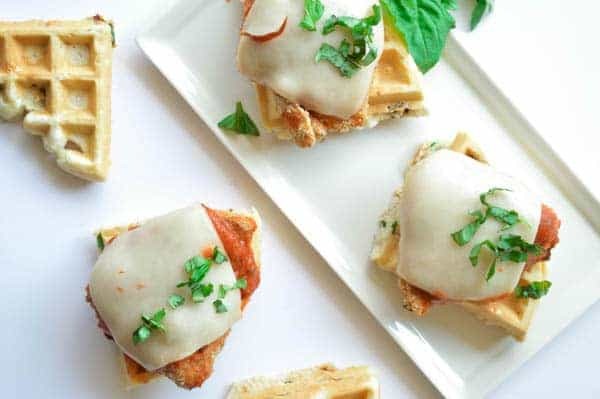 This chicken parmesan waffle sandwich was the perfect meal in our household. Flavorful and fun. 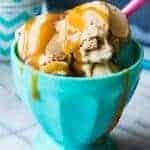 The perfect combination for both the adults and the kids in the house. Of course they’re super excited by anything that involves waffles, I don’t know what it is about them, they just make the littles happy. I suppose it could be because they usually come smothered and covered in a sticky sweet syrup. These waffles though have a wonderful savory taste due to the sundried tomato and fresh basil baked right in. Which of course made them the perfect companion to the chicken parmesan sandwiched in between. Chicken parmesan is always a super easy meal to throw together that looks and tastes as though it took more effort than it actually did. Or at least that’s what I tell myself. Clean up the chicken, dunk it in some milk and egg and coat it in breadcrumbs. Toss it in the oven to bake for a little bit and wham bam it’s done. Not counting the cooking (or the clean up) it takes about 5 minutes to get it going. 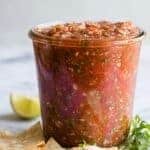 I used a store bought marinara sauce, but absolutely feel free to make your own! I’m in the phase of my life where most of my cooking is done one-handed, due to a certain little one who loves to watch me cook and likes to have the best seat in the house: on my hip, so I do tend to cut a few corners. 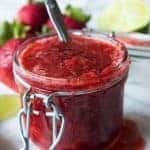 Moral of the story: absolutely substitute any store bought ingredients for homemade if you do so desire and more power to you! While the chicken is baking it’s super easy to toss in some ingredients for the waffles and scoop some batter onto the waffle iron. I broke the waffles into fours to make them sandwich size. So you won’t need to make too many waffles. Each waffle should give you about 2 sandwiches, depending on the type of waffle iron you’re using. I heated up the marinara sauce in a microwave safe bowl. Another step you could exclude if you wish. I like mine warm, plus it melts the cheese just perfectly. And who doesn’t love a good melty cheese on their sandwiches? By the time the waffles are done, the chicken should be about done, and you just have to assemble! I tossed some fresh chopped basil on top of mine, because I had it on hand, and it added just an additional burst of flavor. It really is a simple meal to put together. Like I said earlier, it’s fun and flavorful. Everyone in the house will enjoy! Now if you excuse me, I have to go scrub the baby’s marinara sauce off the wall behind her high chair. Sometimes she enjoys her food a little too much. Clean the chicken by removing any fat, cut the chicken to the size you are wanting your patty’s to be for the sandwich. In a bowl stir to combine the egg and milk, in another bowl combine the bread crumbs, garlic powder, salt, and parmesan cheese. Dunk the chicken in the egg mixture to coat and then coat in the breadcrumb mixture. Place the chicken into a large greased baking pan, I used a glass baking dish. Bake at 425 for 15 minutes, then reduce the heat to 375 and bake for an additional 10-13 minutes until fully cooked. Combine the milk and vegetable oil in a large bowl. In another bowl stir the flour, baking powder, and salt together. Add the wet ingredients into the bowl with the dry ingredients. Stir to combine. Beat the eggs in a separate bowl, and fold into the batter. Add in the sundried tomato (blot dry if they were stored in oil), and the basil. Fold into the batter. 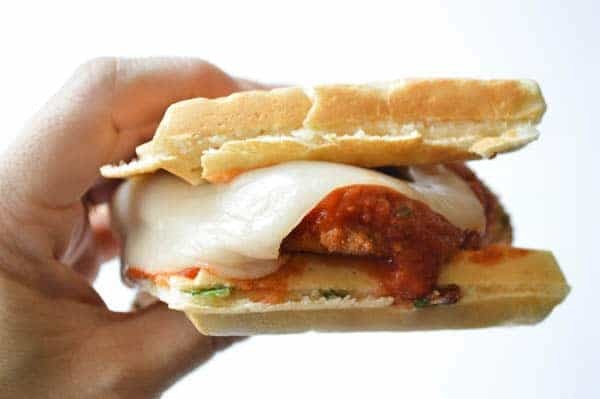 Assemble sandwiches by layering marinara sauce and then mozzarella cheese on top of the chicken patties. 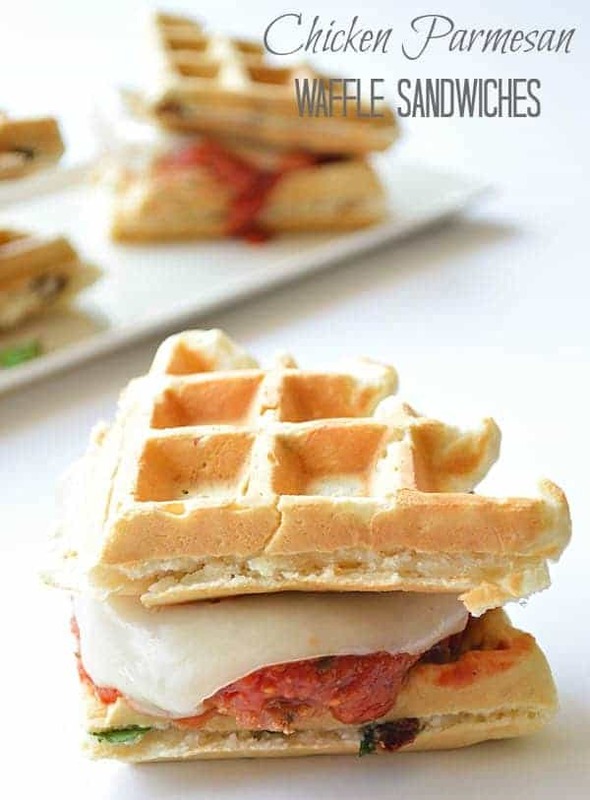 Sandwich between the waffles. You know I love these so much, needs to happen here soon! You inspired me to use my waffle iron Matt 🙂 thanks! Holy mac! These look absolutely fab!! Very creative! Breakfast for dinner is always a good thing. 🙂 My kids would love these, they are obsessed with Waffles! Oooh, this is brilliant! I want one! This is a genius idea Serene! Pinning this one for sure! I love the savory waffle bread on these, Serene. You are so clever! We would devour these in record time at our house! 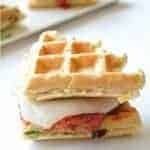 These waffle sandwiches look amazing, Serene! 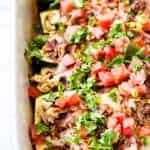 My family would love this – such a great and tasty idea! Pinning! I just got an iron ‘new/old’ waffle iron and I can not wait to try my waffles as sandwiches. Thanks! This definitely gets a pin! Wow, that looks so good! Thanks for sharing. I’d love it if you’d stop by and link this up on my blog. All of the posts linked get pined. Happy Wednesday! I LOVE this idea! Those sandwiches look amazing! Cannot wait to make savory waffles now that I’ve finally mastered my waffle maker. These look SO GOOD! So glad you enjoyed! Thanks George!